Originally developed for the use by the military, infrared detectors now have important applications in engineering, medicine and industry. This book describes the optical detection process and the electronics involved in mimicing the eye. This text covers the range of subjects necessary for the understanding of modern infrared-imaging systems at a level appropriate for seniors or first-year graduate students in physics or electrical engineering. The first six chapters focus on fundamental background issues of radiation detection, beginning with the basics of geometrical optics and finishing with a discussion of the figures of merit used for describing the signal-to-noise performance of a detector system. Other topics include radiometry and flux-transfer issues, basic radiation-detector mechanisms, and random-process mathematics. The presentation then moves on to specific detector technologies and the fundamental mechanisms of detection, paying special attention to responsivity and noise performance. Devices discussed include photovoltaic detectors, photoconductive detectors, thermal detectors, Schottky-barrier diodes, and bandgap-engineered photodetectors via multiple quantum wells and superlattices. The book concludes with a close look at infrared detection systems and related issues. In the discussion of infrared search systems, the range equation is developed in terms of the optical and detector parameters of the system. A separate chapter is devoted to modulation transfer function, a spatial-frequency-domain description of image quality. The final chapter describes the design equations for thermal-imager systems in terms of noise-equivalent temperature difference and minimum resolvable temperature. Supported and clarified by 470 illustrations and accompanied by an extensive glossary of the nomenclature, this is an excellent text for graduate and senior level courses in radiometry and infrared detectors. It is also a valuable reference for practicing engineers involved in the use, design, analysis, and testing of infrared detector-based systems. Infrared Detectors and Systems is a complete, accessible, and timely exposition of a technology whose applications are increasingly important and widespread. Based on courses presented by two of the field's leading figures, this book provides extensive coverage of the background and fundamentals of radiation detection and goes on to examine specific technologies and systems in depth and, in some cases, for the first time in print. Supplemented with 470 illustrations and a complete glossary of the nomenclature, this is the ideal text for senior- and graduate-level courses in radiometry and optical detection. Dereniak, E. L., Boreman, G. D.
6. 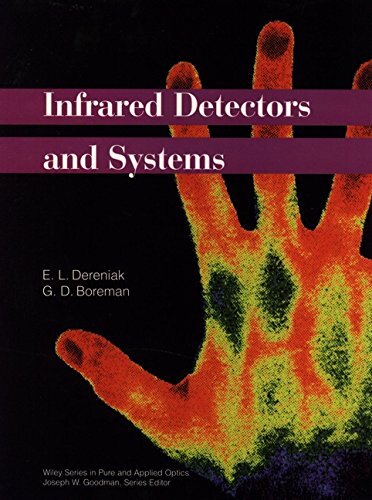 Infrared Detectors and Systems [Hardcover] Dereniak, E. L. and Boreman, G. D.
Dereniak, E. L.; Boreman, G. D.